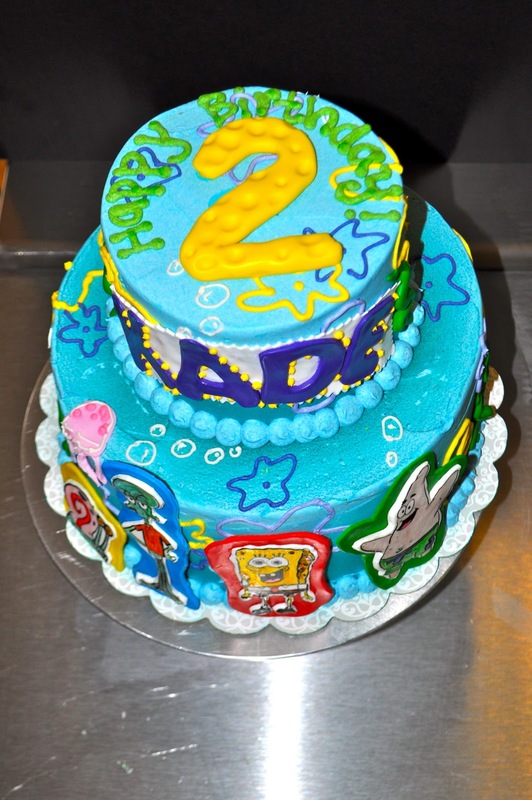 Here we have two 6" cakes for a joint birthday celebration for Lindsay and Daniel! Lindsay, aka Lindy, is a fan of pink martini's and Daniel loves him some UT football.... Hmmmm I see what is going on here, Lindy's got the right idea: You gotta throw back a couple pink martini's in order to make those looooong weekends of 24/7 college football a little easier. I feel ya sister! Lindsay's cake is chocolate with chocolate buttercream filling and buttercream frosting. 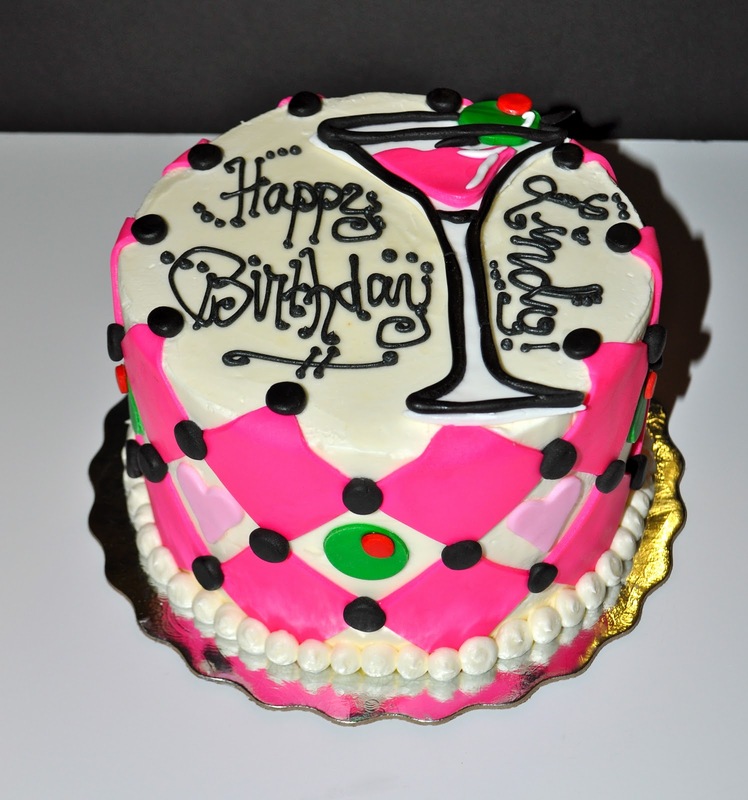 Her pink martini, olives, hearts and diamond decorations are all fondant. 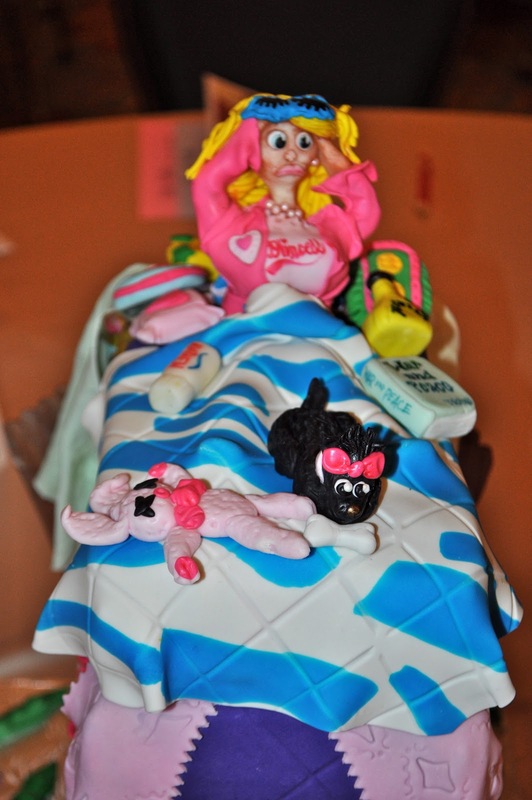 Daniels cake is a strawberry cake with buttercream & fresh strawberry filling and buttercream frosting. 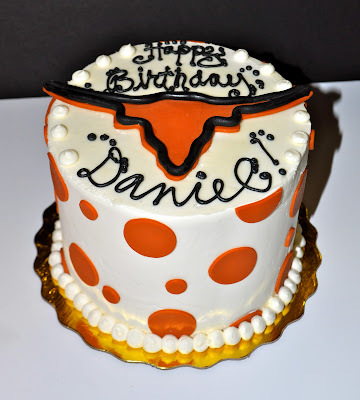 Longhorn and polka dots are also fondant. March has been a great month! Well as March is coming to an end- I have to say, it was a great month! Lots of hard work, lots of exciting new changes, and lots of fun! 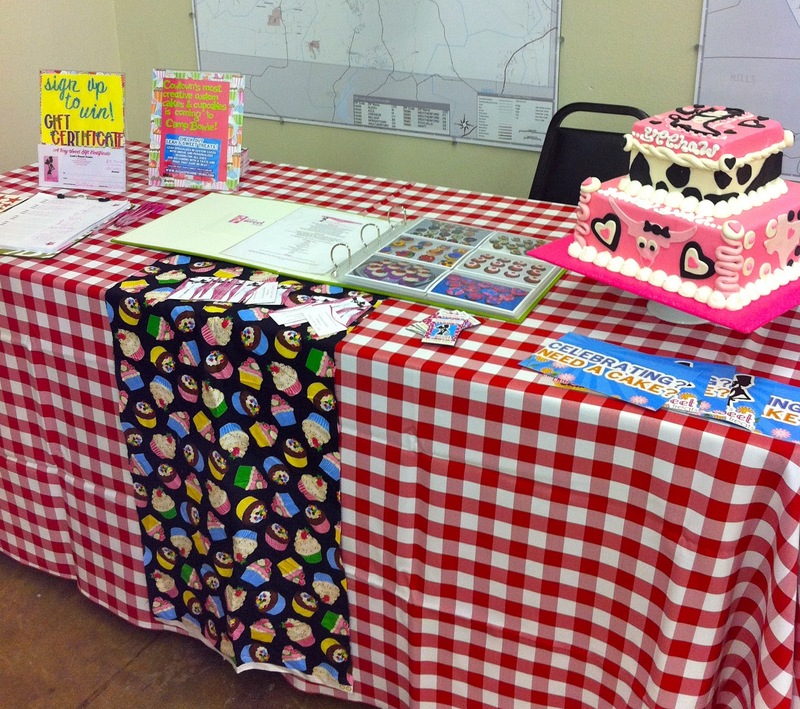 Speaking of such fun: last Saturday I was a sponsor at the Food Bank's "Breakfast with the Stars" annual event. I am not kidding people, I had so much fun! The "stars" were great, kids were having an awesome time, and I met sooo many new, friendly people! Also, if you signed up to win the gift certificate, the lucky winner will be chosen this weekend, and you will be notified by next week!! Just another little note: The phone that I use for my business (817-692-0256) gets terrible service where I am currently working from, so please, please don't hesitate to call again if it goes straight to voicemail or does not ring at all! I always try to call you back the same day if you leave a message, but if I am super busy until the evening I will call you back the next day. 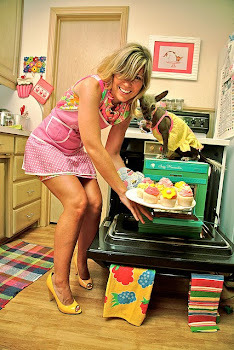 I am also ALWAYS available via email, and it is sometimes easier to get ahold of me that way: Leah@SugarPieHoneyBuns.com. That way if you email me in the evening I almost always get back to you that night. I am sooooo looking forward to April & all the exciting orders already coming in! Be sure to book your Easter treats ASAP- my weekends are filling up fast! That being said- I now need at least 2 weeks notice for larger custom orders, so please try to get in contact as soon as you know you might want to place an order. I hate to turn away anyone, but since this is literally a one girl operation at this point, I can only do so much in one weekend!! Thank you all, have a sweet night! Yesterday I spent about 1.5 hours doing some mind bending cake research: watching 3 episodes of Spongebob Squarepants!! (It's a hard job, but somebody's gotta do it!) This fun cake is for Kade's 2nd Birthday. 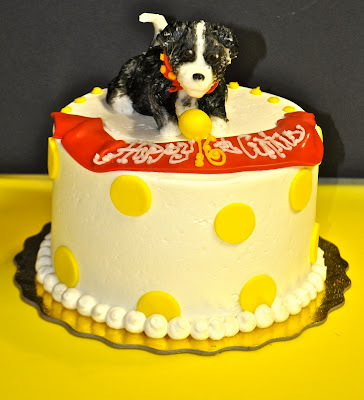 It is a 6" and a 10" stacked, white cake with buttercream filling and frosting. The characters all painted on gumpaste. .........WHOOOO lives in a pineapple under the sea?!?!? 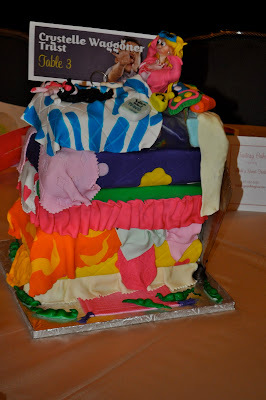 SPONGEBOB CAKE PANTS! Update on the Storefront and other misc. info! Hello all! I now have some opportunity to actually write on my “blog”, so I hope you guys don’t mind reading my rambling. I gotta put that Communication degree to good use………. Right Dad? So here a few updates for everyone! Today I decided to go “spruce up” my window, and hopefully catch some people’s attention off the street!! Last weekend I had put up my 2 hand painted signs, but then I had the idea to paint the windows… Side note/True story: I have always had a dream of being a window painter, especially the awesomeness that usually comes with Wendy’s windows. It is everything I love: Neon colors, block letters, and exclamation points!!! (!!!) Today I was finally able to get a taste of that dream I had since I was a tiny girl, dipping my chicken nuggets in my frosty (ewww, no YUM!! You gotta try it!) I headed over to Party Warehouse and picked up a variety of car window paints, the kind you use at Homecoming etc, and decided to see what I could come up with. Well let me tell you- it’s not that easy to use those darn things for details because the end is just a nub, and you can’t really control the flow, but I think it turned out super cute! Next time, I think I will investigate buying different paint, and using brushes! Also, might I add, *very* proud that I was able to spell everything correctly and have all the letters turned the right direction since I had to do it backwards. Also, I’m sure some of you might be wondering- Geez, what she doesn’t want to fork over the 20 bucks for a legit sign?? Well noooo, thank you very much, I’d rather spend 5 times as much at the craft and party store, hours out of my day, yellow paint all over my favorite shoes (and good thing we are pulling the carpet because there is a giant yellow puddle right by the window!) and do it myself! Because I love doing stuff like that! 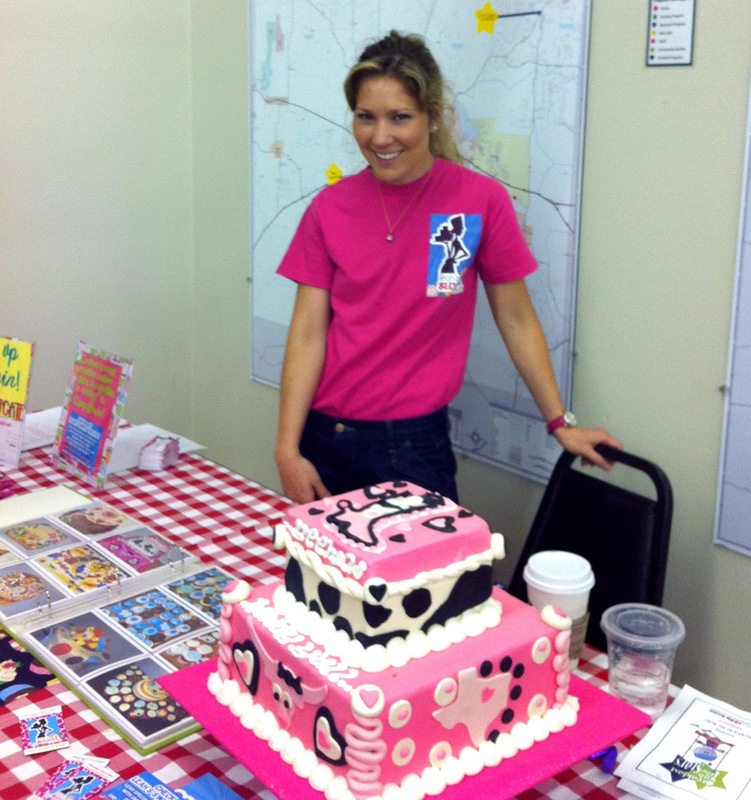 It’s the reason I’m a cake artist! I have always considered myself an “artistic” person, but more than that- I have always loved to MAKE things and DECORATE things. I’m a definite crafter! So although my signage may not be the most “professional” thing in the world, it definitely reflects who I am, and what I love. On another note- I know everyone (including MYSELF!) 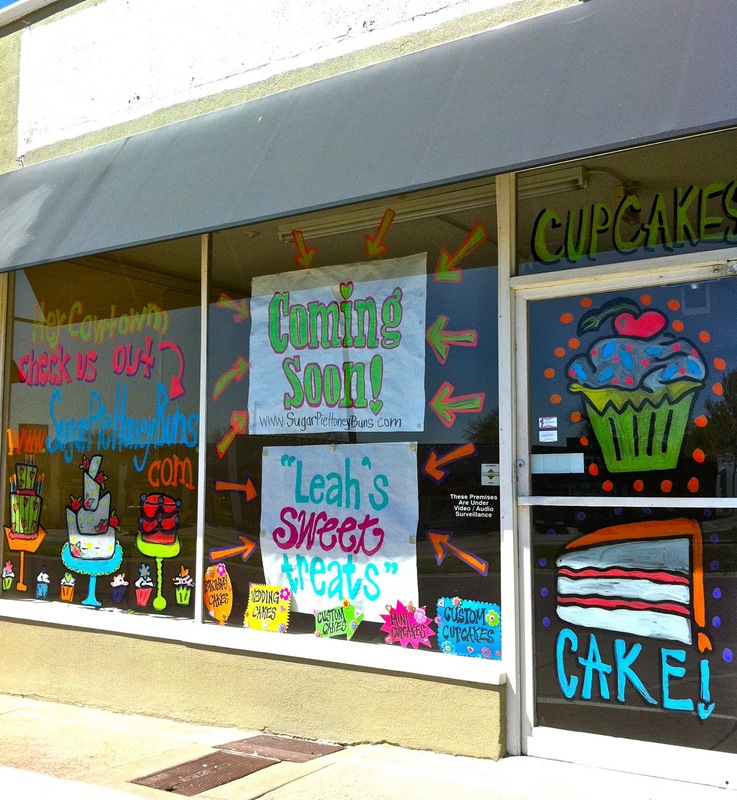 has been asking when Leah’s Sweet Treats will be officially open. It’s hard to tell, but we are hoping hoping hoping for a May date. It all depends on getting things approved by the city more than it does actual renovations. So let’s all send good vibes that our plans get approved ASAP and we don’t have any major road blocks!! Today I also met with Candice from FW Weekly- You guys have to pick up next week’s issue, which has their big “EATS” publication within the regular weekly publication. Tons and tons of Fort Worth restaurants and eateries, reviews, ads, and info! Look for my blurb and ad, very exciting!! And the best part: It's free! And lastly my final note, which people have been asking me about since, well forever: I do not do any kind of gluten free, dairy free, sugar free, or any other kind of dietary needs sweet treats. I hate to turn down any kind of clientele, but I just would hate to put out a product that is sub- standard. I know what I am good at, and I like to only stick to things that I know will be totally satisfying to the customer. That also goes for why I don’t do cookies, cake balls, other pastries, etc. I don’t want to put out a million different products just because I can. 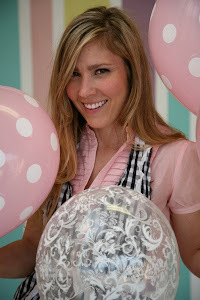 When you get a cupcake or a cake from me, I can guarantee it is going to be moist, delicious, and fresh! Well I think that is all for now, thank you for reading, and have a SWEET day! 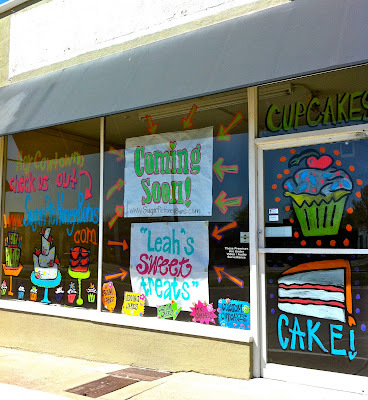 I am so very, very, very excited, happy, ecstatic, and elated to share that as of today, I have signed a lease, and Leah's Sweet Treats will soon be open as a storefront!! We will be located at 4910 Camp Bowie- directly across from Kincaid's Hamburgers, on the bricks!! It is an AWESOME location and space- and I couldn't be more excited!! I will keep everyone updated as we begin renovations of the space, and hopefully will be open for business sometime during the month of May. In the mean time, I will still be doing all my custom orders, and delivering them to you- so please don't hesitate to call!! Here is a view looking out from inside the shop. 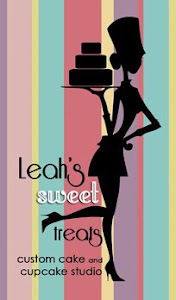 Will keep everyone posted, and again THANK YOU THANK YOU THANK YOU everyone for your support of Leah's Sweet Treats!! 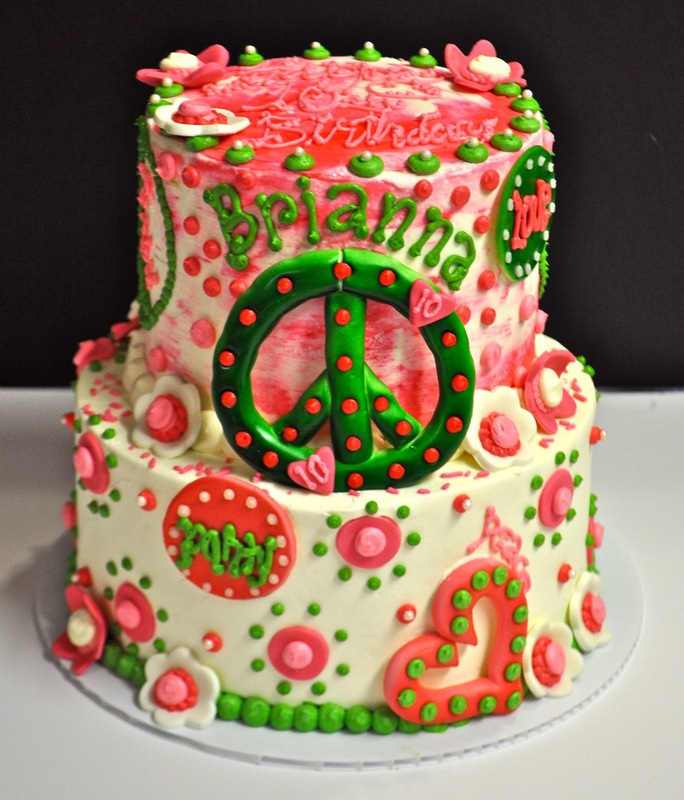 This cake was for Brianna's 10th Birthday Slumber party, with the theme of "Peace, Love, and Party!" The top "tie dye" tier is a confetti cake with buttercream filling, and the bottom tier is marble cake with buttercream filling. 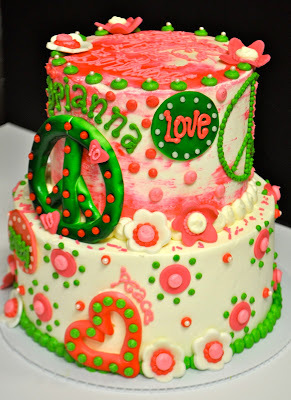 It is covered in buttercream frosting with fondant details and flowers. "OMG! The cake was soooo good.. Brianna, me and her friends loved it.. My fav is the marble.. kids loved the confetti.. This 6" cake was for Curtis' 16th Birthday, who has a Border Collie puppy, Maverick. 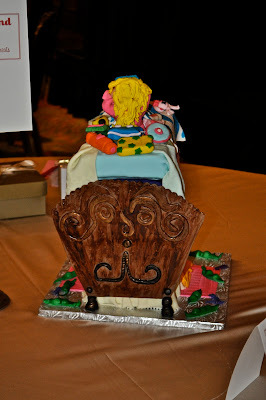 The cake was double chocolate cake with buttercream filling and buttercream frosting. The puppy is made out of white modeling chocolate, and painted with food coloring. 2 Dozen Flower Cupcakes for a 5th Birthday. 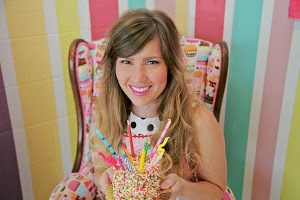 The cupcakes are one dozen double chocolate with buttercream, and one dozen confetti with buttercream. 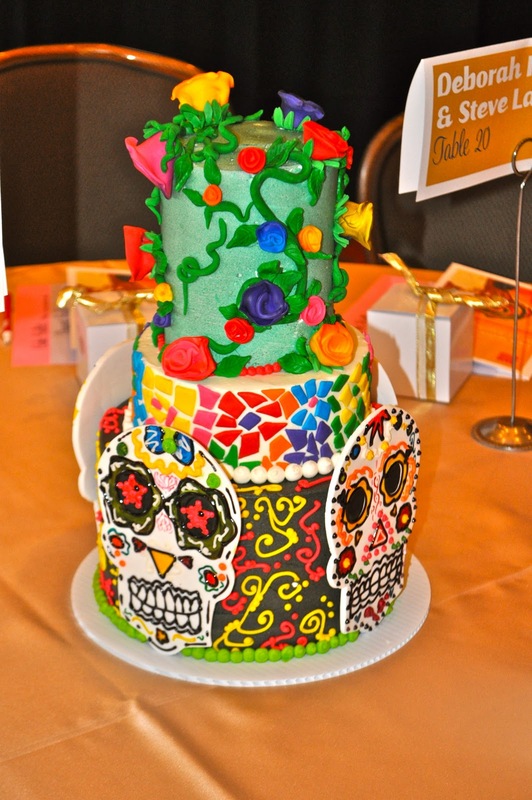 The flowers are made of fondant. I had an awesome time last night at the Lena Pope Home Sweetheart Dessert Fantasy Event at the Fort Worth Club! 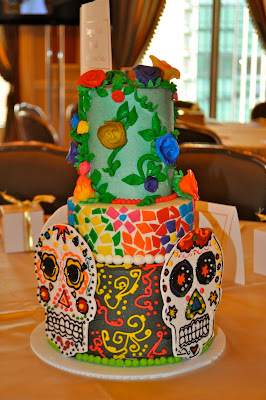 This was my second cake I submitted, with a "Day of the Dead" or Dia de los Muertos theme. 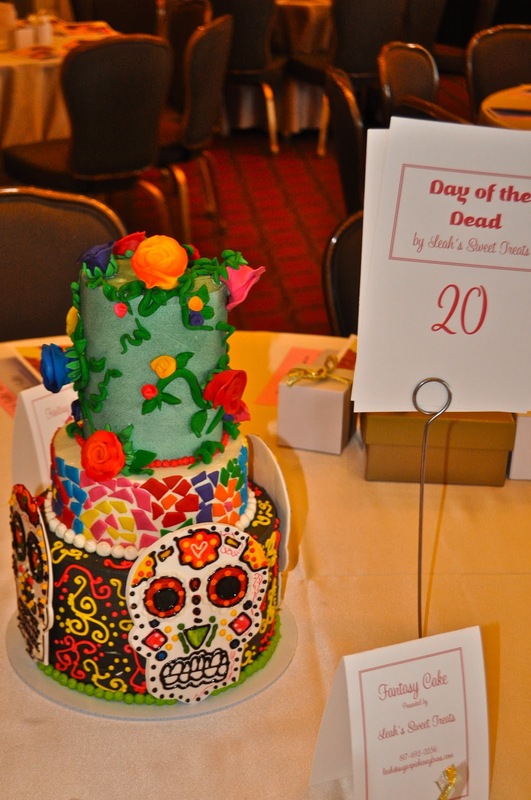 The cake was red velvet on the bottom, strawberry in the middle, and red velvet on the top as well. 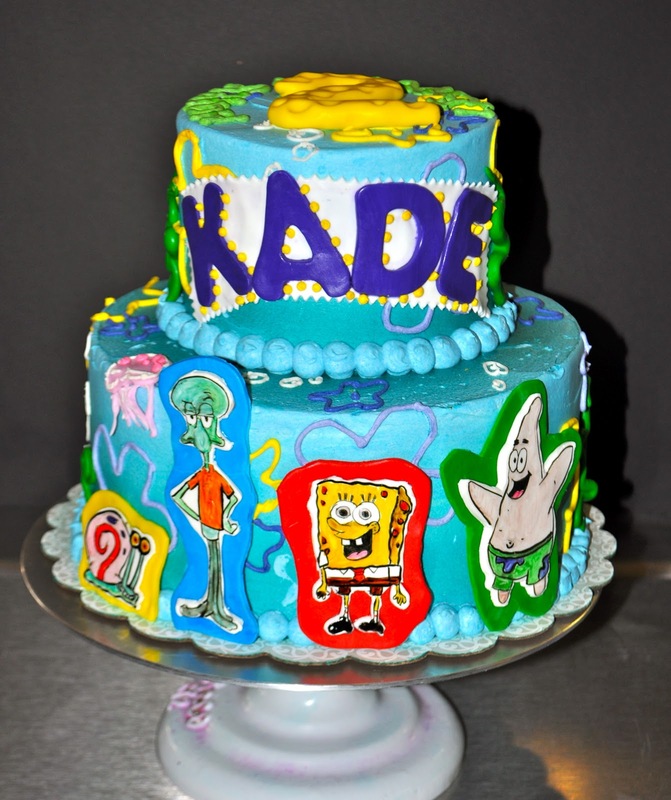 The bottom and top layers were airbrushed black and green. The Skulls were made out of gumpaste, hand painted with food coloring. The "mosaic of tiles" on the middle layer were made out of fondant, and the flowers on top were made out of fondant and also airbrushed. 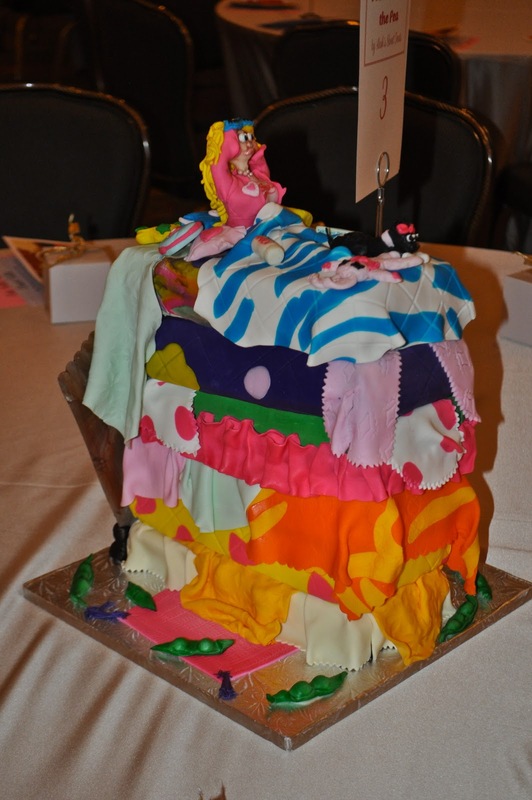 What a fun, bright cake- right up my alley! This cake was made for the Lena Pope Home Sweethearts Dessert Fantasy Cake Competition (Say that 5 times fast!) I chose the theme "Princess and the Pea" with a modern day twist. 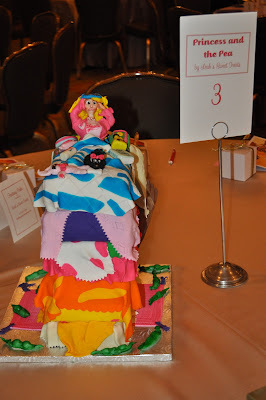 The cake was made out 6 layers of Strawberry Cake and buttercream frosting, all covered with fondant blanket and sheets! The princess was made out of white modeling chocolate and fondant, and all the little details were also made out of fondant. This project was for a "Safari" themed baby shower. 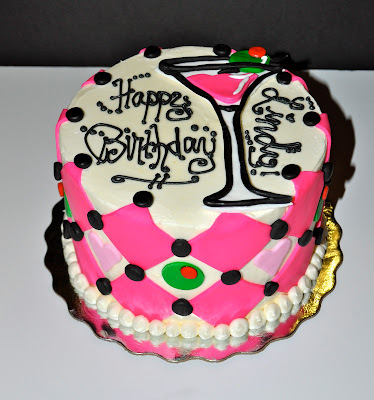 The cake is a 6" Vanilla Bean cake with buttercream filling and frosting. 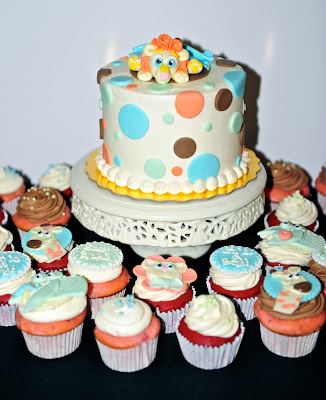 The little baby lion on top is made out of fondant, and there are matching fondant polka dots. The cupcakes are one dozen red velvet with cream cheese frosting, and one dozen strawberry with chocolate and regular buttercream. 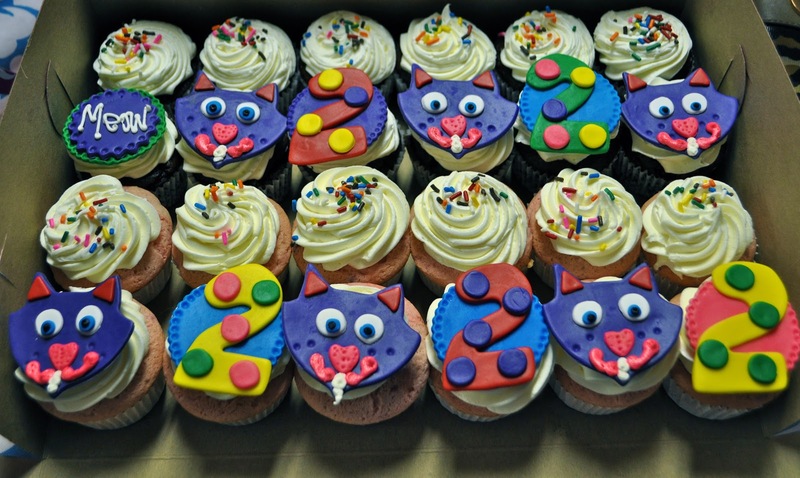 The cupcakes have fondant baby lions, gators, and giraffes. 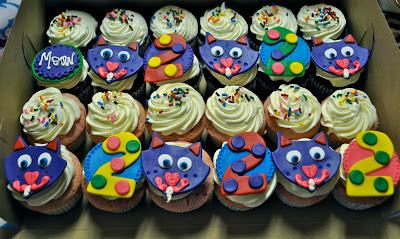 This is 2 dozen "Purple Kitty" cupcakes designed off the invitations for a 2nd Birthday. 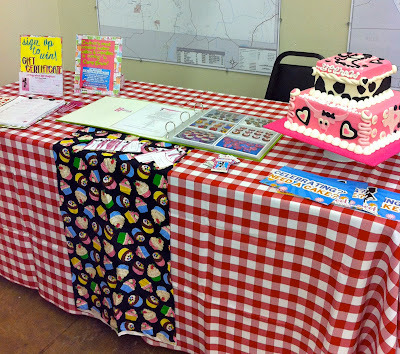 The cupcakes are strawberry and chocolate with buttercream and fondant designs. Here is 3 dozen ladybug cupcakes! 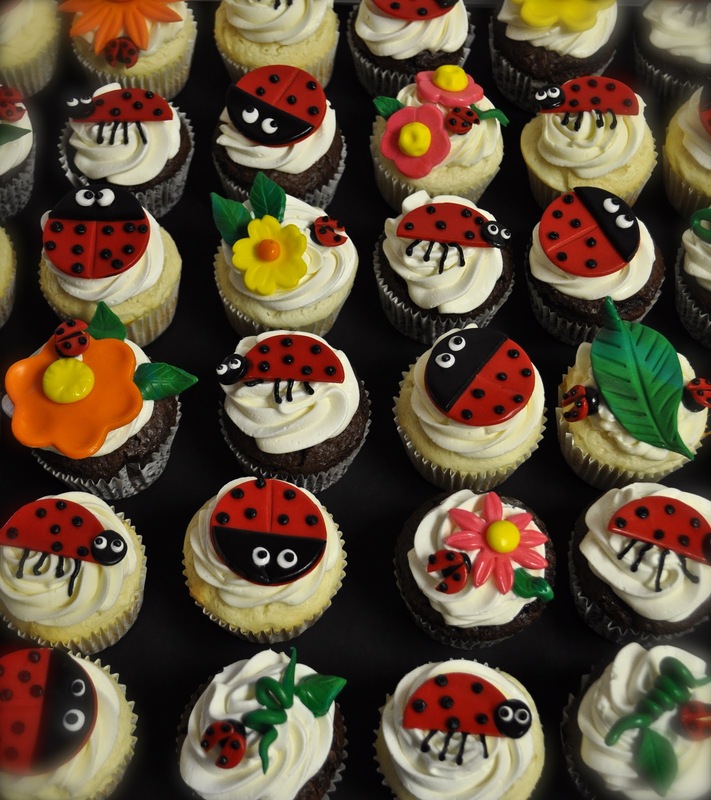 They are white and chocolate cupcakes with buttercream frosting and fondant ladybugs/flowers etc.